Every Friday, TSL keeps it fresh with novel artists, videos, events and so on. The spotlight has hit Chicago native, Calliko, with his latest visuals High Life. With the intro displaying the infamous film “New Jack City,” which starred Wesley Snipes, Ice-T, Allen Payne and Chris Rock, gives us some kind of levity as to what Calliko is rhyming about. Then, we see a long-haired female hula hopping and dancing in a strategical way to the beat of Calliko’s song. A very unorthodox video taken place in a field filled with green pasture, while Calliko is surrounded by associates and has several outfit changes, including the comeback of a tie-dyed sweatshirt. Great track for this overly hot summer afternoon. Kick it inside, trip off of Calliko’s catchphrases and stay hydrated in the meantime! What up TSL Nation! On FRIDAY JULY 5th We’re excited to be bringing you the 2nd edition of “The Get Down” where we combine elements of a Live Band and DJ to make for an electric blend of Hip-Hop. R&B and Funk. This party is also in celebration for TSL’s 2nd year in business!!! Come through and kickoff your SUMMER right with GOOD MUSIC, GOOD VIBES, & GOOD PEOPLES. What an amazing week in hip hop!!! With 2x NBA champ Lebron James announcing that he “ain’t got not worries”, Jay-Z revealing his plans of releasing his “Magna Carta Holy Grail” ablum in a few weeks, and finally, both J. Cole and Kanye West releasing 2 great hip hop albums this week for hip hop listening ears, you would think it couldn’t get any better right??! 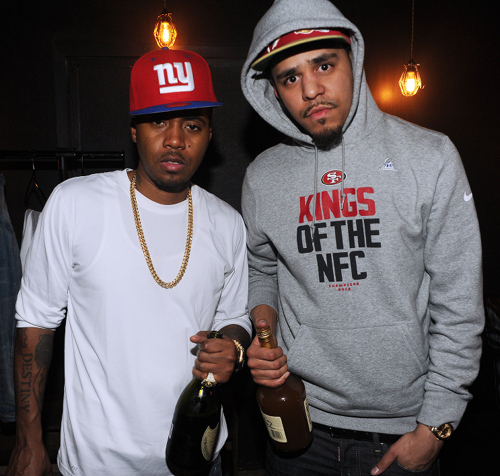 Well… today Nas just relased his response to J Cole’s noteworthy track “I Let Nas Down” from J. Cole’s “Born Sinner” album. Take a seat and listen to the legend humbly speak his mind!!! Let the summer begin!!! G FrSH is the UK-based rapper who does not cease to amaze his audience. With his latest visuals, “Never Can I,” being almost spasmodic and interestingly alluring, we see a grandiose life through the lenses of James Partridge. G FrSH’s dainty fashion compliments the blasé models who are wickedly indifferent to life itself. This satirical music video, from demolishment of the exquisite cakes to the models screaming demonically at the top off of their lungs, creates a mystical life that we all lust for and desire. We would thoroughly enjoy a mash-up of “Never Can I,” which can be heard off of his latest mixtape LEGOMAN II. Boston’s own Avenue Stuns Us with New Visuals! Boston native James Joshua Avenue, known for his stage name ‘Avenue,’ has collaborated with the talented videographer and director Goodwin for these crisp and eloquent visuals. The mystical production was done by another native, HiFadility. This team is one to be reckoned with as Avenue is also known for his telling poetry. Almost trembling to think for his competitors! Rapping for about 9 years now, Avenue has made a compelling name for himself in the city of Boston as well as the surrounding areas. The culture in “I Love My” visuals, featuring a slow yet well-thought verse from Last Days, has been on repeat since we discovered it. Check the video out below and bask in the rawness of what Boston has to offer on a silver platter. Just 24hrs after releasing the track, Rozay and company release the visuals to “Poor Decisions”. Check it out! Georgian songstress and Emerson College alum Mariami begins her 2013 with a brand new song titled “I Cry.” The song is inspired by 90’s Hip-Hop. More specifically a Bad Boy records track “Can’t You See” performed by Total and Biggie. She does Total justice by putting her own spin on that beat and owning it. The song, directed towards a past love, has Mariami telling him everything she’s went through since their love ended. She explains she puts so much emotion and tears into her music in an effort to make sure he knows how she feels without giving him her last piece of pride. I mean what more could I ask for? New R&B that reminds me of Classic R&B and Hip-Hop. That’s a win. This is a great 2013 debut for Mariami. I look forward to hearing much more from this talented singer as the year goes on. Because of your support, 2012 was an incredible year for TSL and we’re even more motivated to make 2013 our best year yet! As a token of our appreciation, we’re excited to be bringing you another edition of TSL’s SOLEFULL SOIREE and this time, it will be at the Foundation Room located inside the legendary HOUSE OF BLUES! Join us on SATURDAY JANUARY 19TH for a night featuring Boston’s best TALENTED ARTISTS performing LIVE ORIGINAL MUSIC and LIVE ART. The TSL Winter/Holiday Collection will also be on SALE at our POP UP SHOP! Nas just dropped another dope visual to compliment yet another one of his dope songs off his latest “Life is Good” album featuring the late great songstress Amy Winehouse!